Shock! Horror! 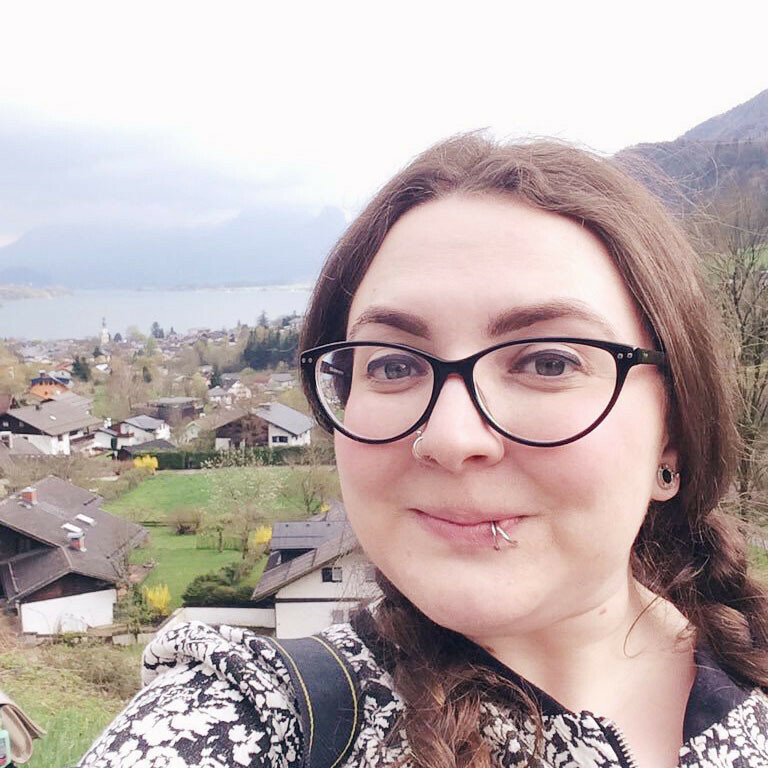 Another Lush review! I know, I know. I'm terrible! It was the January sales though and I just couldn't resist. As this is the post-Christmas sales, a lot of this stuff is no longer available but it might come in handy next year. I know I'm not one for gift sets from Lush, but this was in the sale so it was actually worth the money. 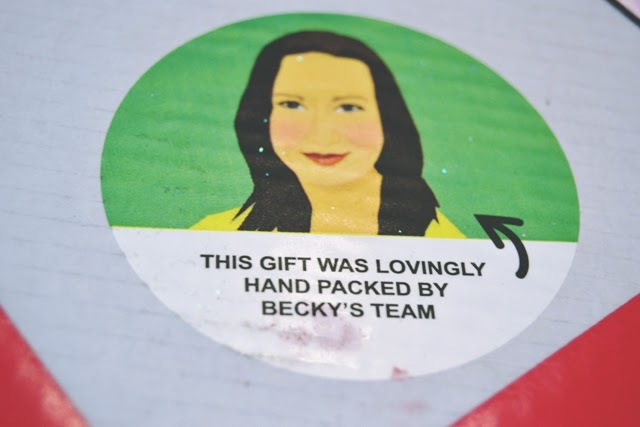 I've reviewed both Secret Santa and Cinders before, so I won't mention them again here. The packaging is so cute. 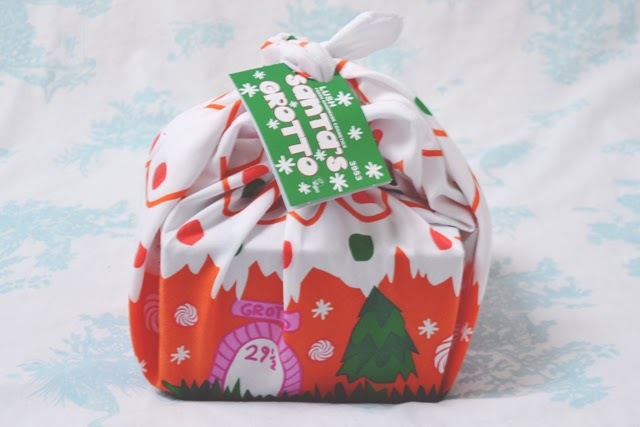 It's wrapped up in a knot wrap inspired by the first Lush store in Poole. 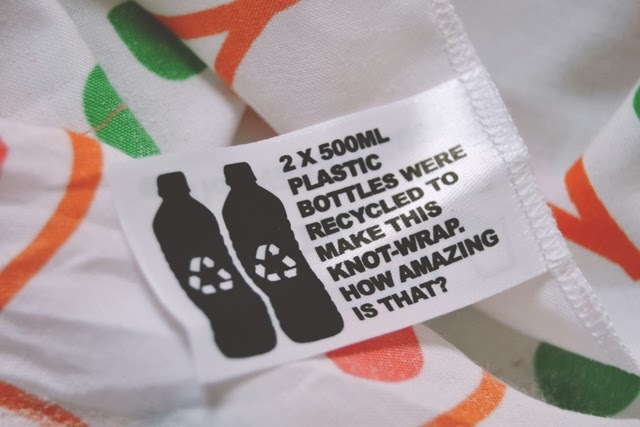 As well as being super cute, the knot wrap is made from recycled bottle tops. Remember you can take your bottle tops into any Lush store to be recycled! 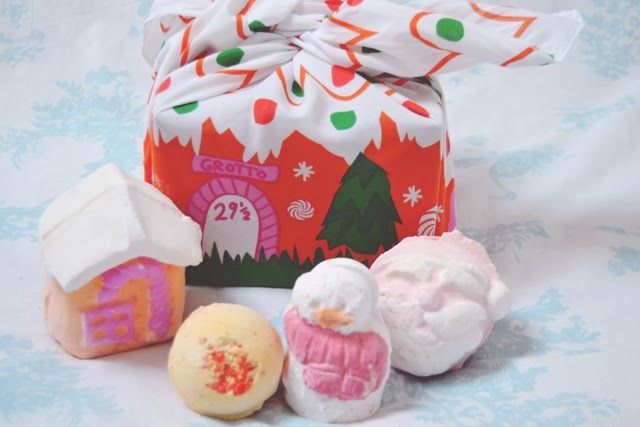 Aside from Cinders and Secret Santa, the gift set includes a Snowman and a Father Christmas bath ballistic. Finally! 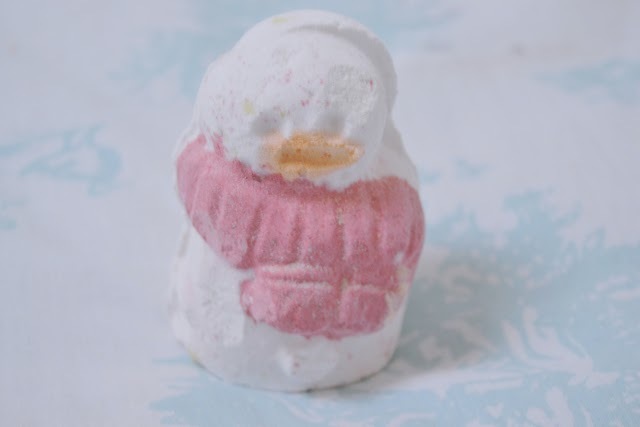 A festive scent from a Lush Christmas product! 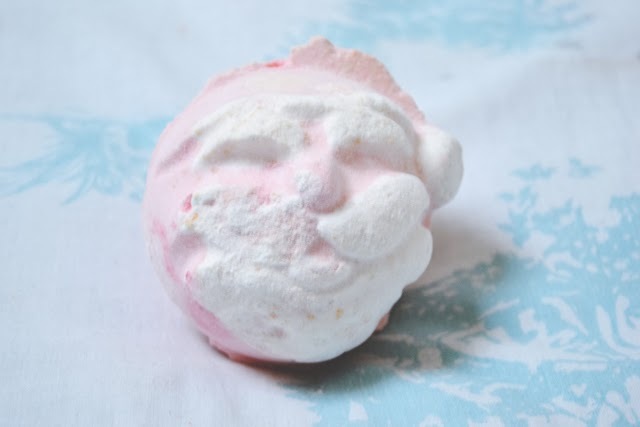 Snowman has a spicy vanilla smell which is really warming and comforting. He has red speckles that turn into globules in the bath. I know that sounds horrible, but bear with me! 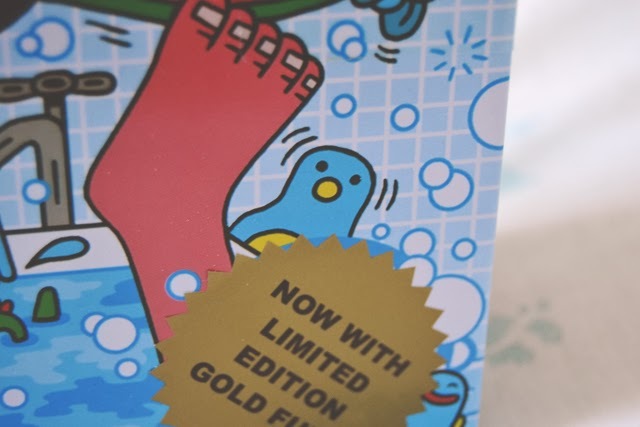 They're really soft and moisturising, turning the bath into a lovely slippery, creamy tub of wonder! This little fella really surprised me. He might look all pink and white but he actually turned my bath a bright emerald. It was extremely fruity with scents of orange and mandarin. He was also super duper fizzy. I could hear him from the other room! 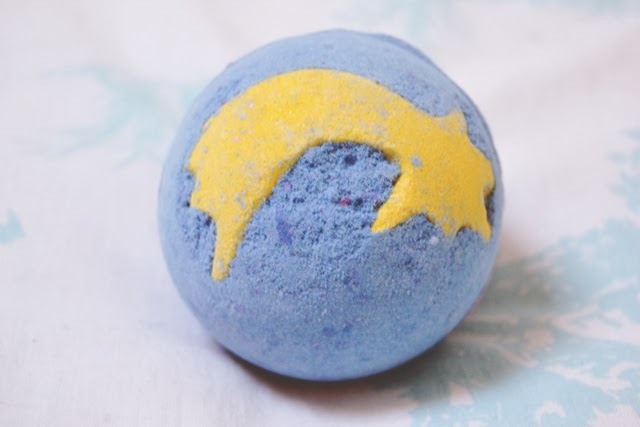 This is one of the prettiest bath ballistics I've used! 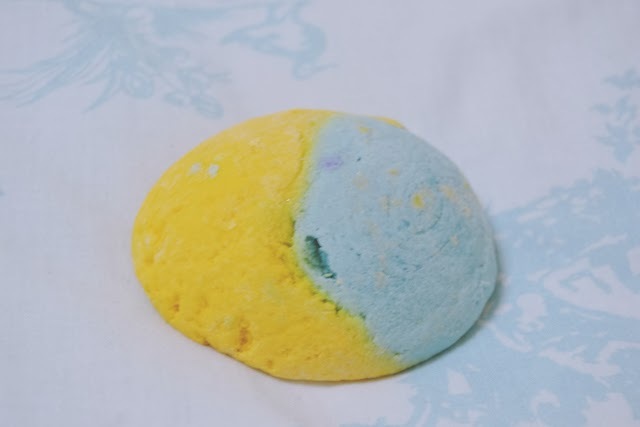 When I dropped it in the bath, the top layer drifted off in a big blue foam, then the bright pink inside started fizzing out the sides. The result was a pale blue and pink marble effect but, when settled, it turned the bath water a really dark indigo. It was so dark, in fact, that I couldn't see the plug at the bottom of the bath! There was a little shimmer to it too. The fragrance is a lovely rich scent which Lush describes as honey-toffee. I absolutely loved this! 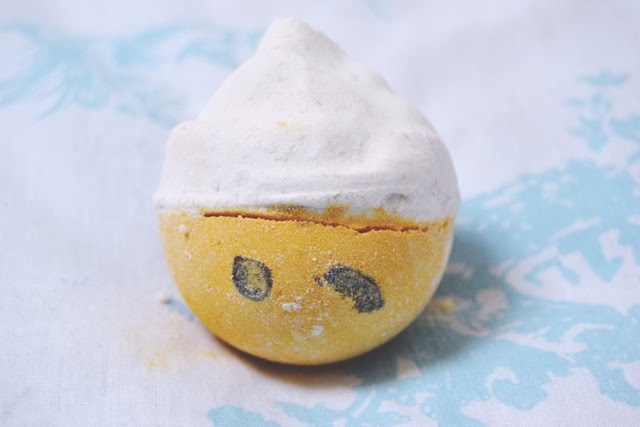 I adore Lush bubble bars! This one has a strong floral, almost soapy scent of Jasmine. It's so relaxing and calming. I'm pretty sure it also produces more bubbles than most bubble bars. Very nice! How could I resist this cute little face? Look at him! I loved this fragrance- a warm lemony, vanilla-y scent. It was really creamy too, with cocoa butter making my skin feel lovely and soft afterwards. I'm going to admit it: I only bought this because I wanted to stock up on Snow Fairy and they were out of bottles. However, I do also love Candy Mountain and I'd always wanted to try Rockstar Soap, plus you can't go wrong with a lip scrub! I got pretty excited when I opened it as it had my name inside! 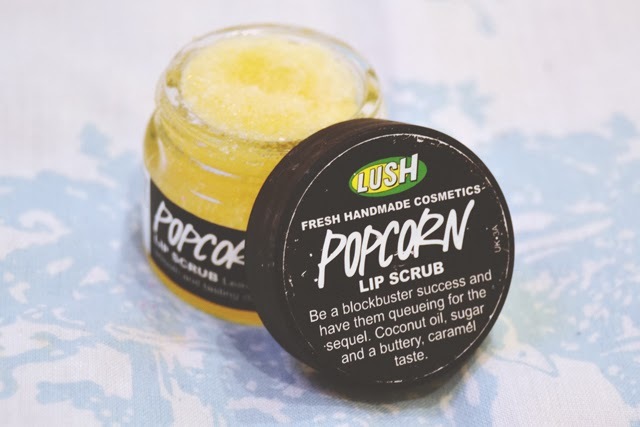 I love the lip scrubs from Lush! The bubblegum is my favourite as I'm such a fan of those sweet, candy flavours but I was excited to try the popcorn one. I'm not sure if it really tastes anything like popcorn. It definitely has a buttery taste but, to me, it tastes more like those burnt bits of popcorn at the bottom of the bag. Nevertheless, it works brilliantly to exfoliate the lips and keeps them super soft! How could I resist something called Fun? I'm not a fan of the cartoon on the front. I find it a bit silly, and not in a good way. 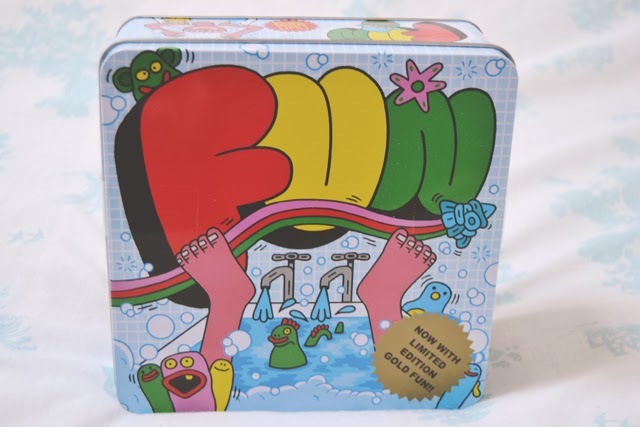 The feet are horrible! I do, however, love the little penguin dude! Look at him, wobbling around all happily! The tin contains 100g packets of all 5 varieties of Fun, including the gold one, and varying sizes of cookie cutter so you can play with it. At first I used 25g and squished it into the bath whilst it was running to create bubbles. It was probably a bit too much as there were too many bubbles! They had a much finer density than the bubble bars, which was interesting, and it made my skin feel somewhat rough and sticky. It also created little beads of excess product sticking to the edge of the bath, making that feel pretty nasty too. As a shampoo and shower gel, it doesn't work at all. It's so difficult to lather, ends up in lumpy bits and leaves my hair and skin dry. It doesn't even work that well as squidgy Plasticene (Yes, I tried! )- It cracks easily, which makes it difficult to mould. So far, I've only tried the pink and green varieties. 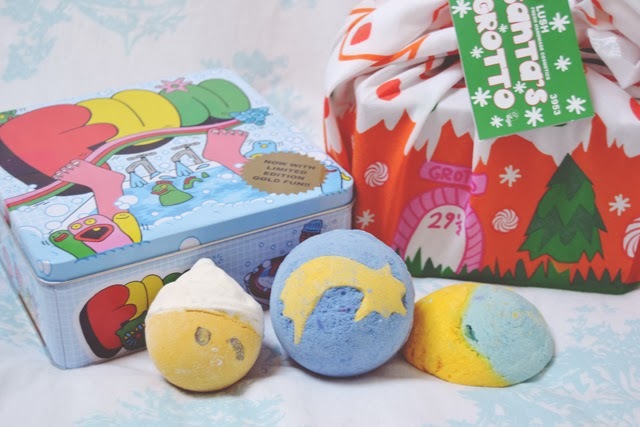 I think I'll be using these as back ups for when I've run out of bubble bars and bath bombs. Pink Fun has a very subtle scent of sweet candies. It's nice but way too delicate to really make any impact. Green Fun smells amazing in the packet. It's a zesty lemon and lime fragrance which smells just like Fruit Pastilles but it loses the scent once you use it. Overall, I'm pretty happy with my stash! I love Lush so much! Snow Fairy is the BEST! I think the popcorn one would be more your thing. 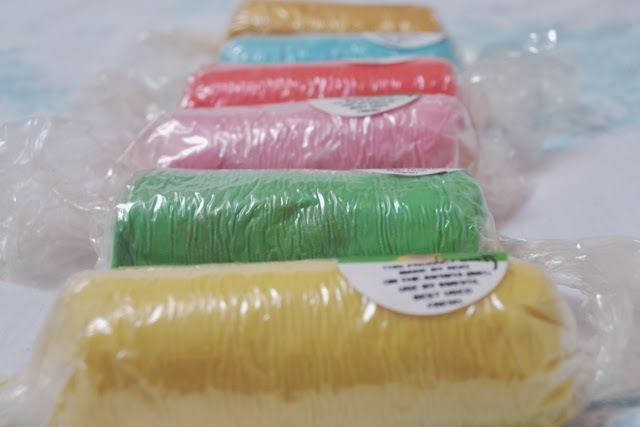 I LOVED the bubblegum one! Haha don't worry- The emerald is normal! I got a bit carried away... I hope you get some for your birthday!